At least one in every 10 South Africans will have trauma this year. 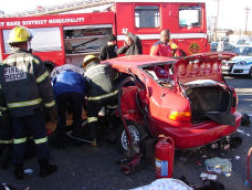 Every 24 minutes somebody in South Africa dies as a result of a motor vehicle accident. For every person that dies, 96 are admitted for treatment at a medical facility. Over 15,000 interpersonal deaths (Murders, suicides, hijackings, etc.) are reported every year. Hi-jacings is up with 12.9% in 2015/2016. Due to a lack of appropriate information at the time of the incident at least one in every eight trauma patients will receive incorrect medical treatment. Crisis situations can strike at any time, be it a medical emergency, trauma, vehicle, criminal or household related incident. Specialists are not always available at all hospitals. CARTE Blanche - "Your card or your life"
There is a high risk of Cell phones being stolen at accident scenes or removed from the owner as a result of the impact of the accident. Cell phones could break as a result of the accident or become trapped somewhere in the wreckage of the car and cannot be reached. In most cases it is very difficult to link a specific patient with a specific cell phone. Relatives are also not up to date with the patient's medical conditions, allergies, medications or medical aid details. The relative listed under ICE may be involved in the same accident. Precious time may be lost and faulty information may cause chaos. Relatives may not know all the important information of the patient, such as medical aid, chronic conditions, etc. Patients often need urgent specialist treatment. Hospitals do not always have a specialist available immediately. Sometimes paramedics have to travel between hospitals to find a specialist that can treat a patient immediately. TIME = LIFE. What does the media have to say? The PRETORIA NEWS of 17 August 2005, reports under the heading 'My son's death could have been prevented' the sad but true story of Advocate Willem Peters who died after he was seriously injured in an accident on the N12 near Witbank. "Willem lay in a State hospital with severe brain damage as an unidentified person for 16 hours before his family found him." The report starts with the following: "A young advocate's life might have been saved if he had been identified sooner and received maximum treatment in the essential golden hour after the accident." Peter's wife and his father became worried when they did not hear from him. They phoned every hospital and police station in the area. That night they activated Peter's tracking system. His car was traced to a panel beater. Only then did the family hear about the accident that occurred early that morning. A relative found him in a coma at the Witbank General Hospital. He died that same evening. Time was against him. We offer a unique and effective, professionally developed identification system operated by a reliable emergency call centre. It provides lifesaving information to emergency personnel. It offers peace of mind to family members who is informed about progress with the emergency. This system was developed by the user, paramedics! Since time can determine life or death, CrisisOnCall always utilises the nearest available ambulance service provider. We also pay for these services from the incident to the doors of the hospital. (This applies irrespective of your status as medical aid member or not) TIME = LIFE! When you or your family travel, they could be monitored regularly to ascertain whether everything is running smoothly. The combination of services makes it much easier in a crisis - only one number to call. This makes CrisisOnCall different and unique. No person in South Africa should be without it! Many medical aid funds provide stickers with the funds' name and an emergency number - without a membership number, or any identification of who the member is! The sticker does not apply to any specific occupant of the vehicle. Stickers do not contain important medical information like the medical aid number, medical conditions, allergies and chronic medications. Vehicles are often sold with stickers left attached to the window. The new owner might also add another sticker to the window. In severe accidents windows are broken and the sticker on the window will also be in pieces. A vehicle sticker is therefore unreliable, unnecessary and ineffective. In fact, most paramedics ignore vehicle stickers. The windscreen is normally the first window to shatter. The license disk will then be in pieces or removed from the vehicle as result of the impact of the accident. The smart code can only be read by a smartphone. Not everyone has access to a smart phone and the process wastes time. When a vehicle is sold the license disc stays with the vehicle and the new owner can thus not be linked to the information on the disc. Paramedics prefer a system where two way communication is available. Glen Preston B.Tech paramedic from Hibiscus Med-Evac Service (South Coast) wrote scanning of barcodes is a slow and cumbersome system due to windshields that break or shatter and slow cellphone networks. This makes the scanning system ineffective. CrisisOnCall fills the gap between the incident and the medical aid information! The reality is that crime, accidents and medical incidents, to name but a few, happen every day. The worst thing you can say is "It will not happen to me or my family". CrisisOnCall offers the solution of a system that can communicate on your behalf when you or your family needs it most. Paramedics agree that the right information helps them to save a life. Shanelle Gordon, paramedic, wrote to us in support of the wristband identification. She says that it is a wonderful idea and also relates how difficult it is to obtain a patient's information, especially when they are unconscious. While conducting research, CrisisOnCall found yet again that items like jewellery, key holders, stickers, cards and any loose items that cannot easily be linked to a patient, are not always effective. Don't say "it won't happen to me" or "my medical aid sticker will do the necessary when something happens to me or my family"
Lack of lifesaving information may one day mean precious TIME that is lost, which could have meant the difference between life and death. Now is the TIME for you and your family to become members of CrisisOnCall! "Who will assist you in an emergency?"